Abu Khaled knows the worth of things. As a small-time smuggler living along the porous border between Syria and Lebanon, he has dabbled in antiquities as much as the cigarettes, stolen goods and weapons that make up the bulk of his trade. 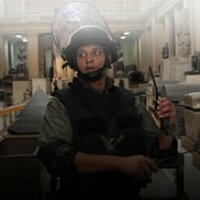 So when a smuggler from Syria brought him a small, alabaster statue of a seated man a few weeks ago, he figured that the carving, most likely looted from one of Syria’s two dozen heritage museums or one of its hundreds of archaeological sites, could be worth a couple thousand dollars in Lebanon’s antiquities black market. So he called his contacts in Beirut. But instead of asking for cash, he asked for something even more valuable: weapons. “War is good for us,” he says of the community of smugglers that regularly transit the nearby border. “We buy antiquities cheap, and then sell weapons expensively.” That business, he says, is about to get better. Fighters allied with the Free Syrian Army units battling the regime of Syrian President Bashar Assad have told him that they are developing an association of diggers dedicated to finding antiquities in order to fund the revolution. “The rebels need weapons, and antiquities are an easy way to buy them,” says Abu Khaled, who goes by his nickname in order to protect his identity. Criminal activity thrives in chaos, and the theft of antiquities for a rapacious international black market is no exception. Lebanon, Iraq and Afghanistan have all fallen victim to looters during previous wars, and Libya and Egypt, rich in archaeological sites, witnessed several attempts at looting during their more recent uprisings. In the case of Syria, however, the full-blown civil war may do more harm than simply the plundering of its culture. The burgeoning market for this ancient land’s priceless treasures could actually prolong and intensify the conflict, providing a ready supply of goods to be traded for weapons. Furthermore, the ongoing devastation inflicted on the country’s stunning archaeological sites—bullet holes lodged in walls of its ancient Roman cities, the debris of Byzantine churches, early mosques and crusader fortresses—rob Syria of its best chance for a post-conflict economic boom based on tourism, which, until the conflict started 18 months ago, contributed 12% to the national income. Syria’s grim human toll—at least 20,000 dead, some 250,000 registered refugees and an estimated 1.2 million internally displaced, according to the UN— has been echoed by devastating attacks on the country’s archaeological heritage. All six of Syria’s UNESCO world heritage sites have been damaged by rocket, tank and small-arms fire, some “potentially irreversibly,” according to archaeologist Emma Cunliffe, a PhD researcher at the United Kingdom’s Durham University who has just published a report detailing the destruction of Syria’s historical sites. “Archaeologically speaking, Syria is a disaster zone,” she says. Theft from some of the country’s poorly guarded regional museums has added to the toll—an 8th century BC Aramaic god from the Hama museum made Interpol’s Most Wanted Works of Art poster in December — as has the wholesale plundering of thousands of half-excavated archaeological sites in Syria. Cunliffe, who hasn’t visited Syria since the start of the uprising, bases her reporting on a network of Syrian volunteers who started documenting the depredations around them on a Facebook page, Syrian Heritage Under Threat. The Syrian government has sharply limited the number of foreign journalists entering the country, so these accounts cannot be independently verified. Syria has been at the crossroads of culture and religion for millennia. The world’s first agricultural societies are thought to have sprung upon its fertile plains, and Damascus is one of the longest continually inhabited city in the world, with early temples dating back an estimated 5000 years. Alexander the Great’s Macedonian lieutenants built vast cities in Palmyra and Apamea, and the Apostle Paul sheltered in Damascus after his conversion to Christianity. Some of the country’s Islamic mosques, still in use today, were built during the Prophet Muhammad’s time. According to Cunliffe, archaeologists have only just begun to understand the history that Syria’s multitude of sites can tell. “There is still more to be found underground than decades of archaeological work have brought to the surface,” she says. That bounty has long proved irresistible, but a mandatory 10-15-year prison sentence, enforced by the regime’s ubiquitous secret police, curbed the worst of the looting. The sheer diversity of Syrian antiquities—everything from Mesopotamian cylinder seals, Roman statues, early Christian iconography, Jewish incantation bowls, and centuries-old Korans have passed through smuggler hands —means that the appetite for illicitly-acquired artifacts is unlikely to be sated. Abu Jabbar, a second-generation antiquities smuggler based in Beirut who goes by a professional nickname, says he has seen an explosion in amateur diggers in Syria, all trying to take advantage of the conflict to earn a few extra dollars, whether to buy bread or weapons. “War is an opportunity. For us, and for arms dealers,” he says with a dark smile. Responsibility for the country’s cultural destruction falls on both sides of the conflict, from the military that shells ancient citadels to the rebels that hide within. The looting is being carried out by all sorts of opportunists. Abu Jabbar’s most recent acquisition, a necklace of hammered-gold beads and large triangles he reckons is two centuries old, came to him via a provincial government official, he says. Abu Khaled, the smuggler with the alabaster statue, says that he has bought looted items from both sides. “Even the regime is dealing with antiquities, because they are collapsing economically. They need cash money to pay the shabiha [hired thugs].” Neither case could be independently verified. Yet, both the Assad regime and the rebels have actively sought to use the destruction of Syria’s heritage sites for propaganda purposes. The regime blames the FSA and “terrorists” for the looting, while the opposition highlights the military’s indiscriminate use of heavy artillery against historic sites, like the 12th century Krac de Chevaliers fortress that was, before the uprising, one of the most visited destinations in Syria. Even the Facebook group has been accused of having an anti-regime bias, excising posts that may incriminate rebels. According to a member who did not want to be identified for fear of inciting a backlash, one such photo appeared to show a FSA soldier draped in a priest’s stole, waving a processional cross looted from a Homs church.